How do the following five 3D/VR Platforms hardware costs compare? In the single most comprehensive hands-on side-by-side analysis, We Get Around Blog Guest Columnist, Paul Collart, charts where he compares the hardware costs of these five 3D/VR Platforms. Are these hardware cost comparison charts help to you? I'm reading your blog post and this is some serious primary R&D. Thanks for making this info available to all of us. 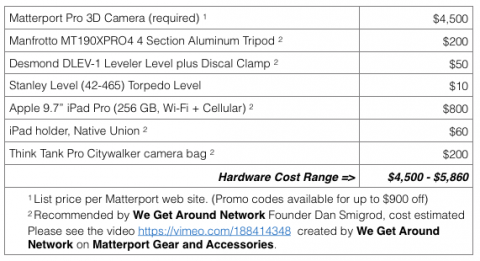 I think that the iPad Air 2 is the ideal iPad for Matterport -- it hits the sweet spot for pricing, it's easier to hold. Perhaps it is worth noting iPad Pro = 128GB storage vs. iPad Air 2 being 32GB storage. Perhaps add a price range on that. @Tosolini Yes. Thanks to @pcollart for this serious primary R&D and for allowing We Get Around to publish it and share it with the We Get Around Network Forum Community.